Get rid of fleas, ticks, bedbugs, ants and any exoskeleton insect naturally with 100% food grade diatomaceous earth. What is diatomaceous earth or DE? Detoxify the body by cleansing the digestive tract, boosting liver function, helps eliminate heavy metals in the body such as aluminum, and acts as a detoxifier for the blood since it carries a negative charge that attaches to free radicals and other harmful toxins. Fights parasites by adding to the feed given to pets and farm animals. Can be used as a natural insecticide, since it absorbs lipids from the waxy outer layer of insets’ exoskeletons, which causes them to dehydrate and die. DE can be used to eliminate bed bugs, house dust mites, cockroach, ants and fleas, without the use of toxic chemicals. Beneficial for joints and bones and can help prevent low bone mass. Helps clean and protect skin, nails and teethe. The use that I thought was interesting was for ants and fleas. These are two very hardy insects and hard to get rid of once they make your way into your home. Diatomaceous earth is a really inexpensive way to control external and internal parasites in your dog and cat. The microscopically sharp edges contact the insect or parasite, and pierce their protective coating, so they soon dehydrate and die. The larvae is affected in the same way. But DE is completely harmless to animals. The only thing that you should be very careful about is not inhaling a lot into your lungs. It is easy to do, so if need be, wear a mask if you think you might inhale a lot while working with your pet. DE can be placed on your pet, cat or dog and the powder rubbed through the fur to the skin. When the fleas come in contact with the DE, it will help the eliminate them. I don’t have a flea problem in the house, but I have had to deal with it in the past. I with I had know about DE. One problem I am anxious to try this out on is ants. I have had an ant problem in the house for about a year now. They haven’t taken over, just around enough to be a real annoyance. Another use I would really like to try this out out on, is with the chickens. It appears that DE can really help chickens with egg production. The Food and Drug Administration lists Food Grade diatomaceous earth as “Generally Recognized as Safe”, which means it’s legally allowed to be added to many different types of foods, beverages and supplements. 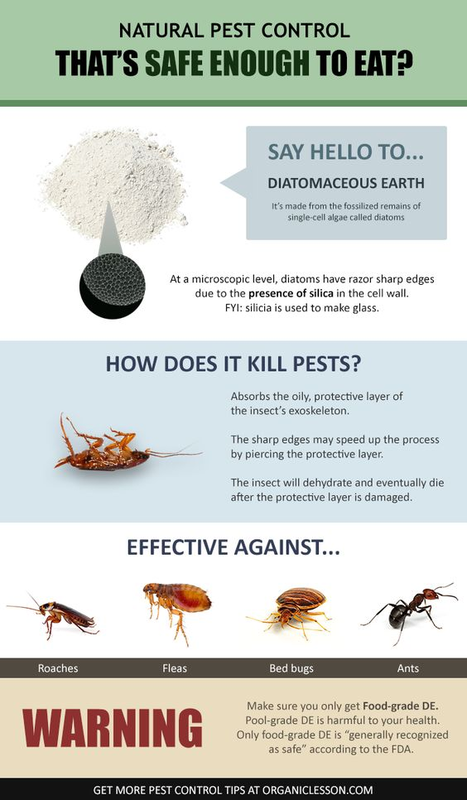 In summary, it is my belief that Diatomaceious Earth can be a very useful product for eliminating pest naturally. I do not know enough about the product that I would necessarily take it internally, but I would not be opposed to trying it. Scott, Dana. “Diatomaceous Earth: Get Rid Of Fleas & Ticks Naturally!” Dogs Naturally Magazine. N.p., 01 May 2017. Web. 26 June 2017. “The Most Versatile Detoxifier Around.” Dr. Axe. N.p., n.d. Web. 26 June 2017. “Before You Go…” DiatomaceousEarth.com Official Site to Learn About Diatomaceous Earth. N.p., n.d. Web. 26 June 2017. Winger, Jill “How to Use Diatomaceous Earth.” The Prairie Homestead. N.p., 26 Sept. 2016. Web. 26 June 2017.